Tillite Renosterveld, one of the most rapidly decreasing vegetation types, is unique and extremely threatened. Most of it has been lost because of agriculture with less than 5% remaining. Practically all of the remaining Tillite Renosterveld can be found on land in private ownership. Invading alien plants have put the remnants of Tillite Renosterveld under even more pressure. Other factors, such as careless crop spraying have added to the problem. Tillite soils are derived from Dwyka sediments. The Dwyka rocks were formed when a massive glacier covered the entire Karoo area almost 300 million years ago. These yellow or grey soils have a high clay content, caused by chemical changes that occur when the soil becomes waterlogged during winter. It is slightly acidic. These fertile tillite soils are critically endangered because they are sought after for cultivation. The soil supports shrubs and an astounding variety of bulbs and annuals. It produces an intricate floral tapestry of unrivalled richness. It is not uncommon to find 50 different species within 1 m² and in some areas an unbelievable 25 000 individual bulbs underground! 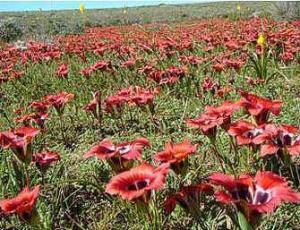 The rich diversity of bulb species in the Renosterveld is overwhelming when compared to any other place in the world. A lot of them can only be seen in tiny areas of veld, especially on the edges of roads and between agricultural fields. The annuals include the delicate white cotula, Cotula nudicaulis, various species of nemesia, including the striking Nemesia cheiranthus, and mauve-flowered basterpershongerblom, Senecio cakilefolius. The geophytes include many romuleas, lachenalias, ornithogalums, some hesperanthas and many more genera. Most spectacular are the brilliant, deep blue Pride-of-Nieuwoudtville, Geissorhiza splendidissima, sky blue bloukalossie, Ixia rapunculoides and the coppery pink Sparaxis elegans. This dense concentration of bulb species is possible because the rootstocks of different species grow at different depths in the soil. Special contractile roots pull the bulbs and corms down to the depth appropriate for each species. The pollination and dispersal of seed of these striking flowers is dependent on highly specialised insects and birds. 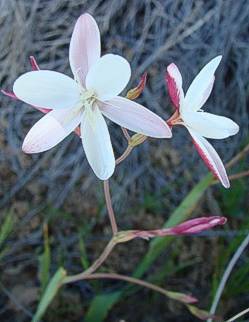 The delicate Hesperantha cucullata (aandblom) is a geophyte with sword-shaped leaves, growing 15 – 30 cm tall. It is also known as the bokkeveldbontrokkie. Their fragrant flowers are borne on spikes and are white, with a reddish-to-brown tinge on the reverse, 18 – 22 mm across, opening in the late afternoon. Flowers are pollinated by a few noctuid (nocturnal) moths as well as by long-tongued flies. They make ideal pot plants. By the end of November the corms can be removed. They can then be stored in a dry place until March the following year when they can be replanted. Flowering time is usually from July to September, mostly in the Renosterveld. Romulea sabulosa (satynblom) is a beautiful, brightly coloured, stemless geophyte, up to 10 cm, with a rounded corm at its base. They have several, needle-like basal leaves. Their flowers are a large, glossy red with a cream cup marked with black, 35 – 40 mm across. Flowering time is July – September. They are an endemic species that occur mostly on clay soils in the Renosterveld.